Every student at Trident has a different reason for obtaining a degree. Their motivation comes from different obstacles or challenges they may have faced or their will to keep pushing forward to better themselves and their families. That is what makes our students great and their motivation makes it easier for us to help them achieve their goals. 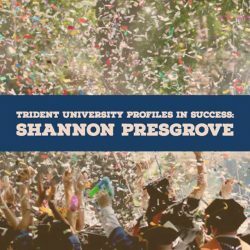 Continue reading to learn more about Shannon and her journey at Trident University. Trident: During your time at Trident, have you made moves upward in your career? Shannon Presgrove: I was promoted into my first front-line leadership role with ADP the same month I enrolled at Trident in June 2016. I was promoted again to manage a larger dedicated client service team in December 2017. Trident: Do you feel that your time as a student at Trident prepared you for a current professional role? SP: Absolutely. The critical thinking skills and written communication skills learned and reinforced in my classes helped me to have a competitive edge when going for the promotional opportunities. I feel sharp and confident. Trident: Who are some of the professors or staff that left a positive impression on you? SP: Michael Minnaugh, my Student Success Advisor, has made the most memorable impression on me with his encouragement, mentoring tips, and weekly check-ins which help me to maintain focus and feel accountable and cared about. Trident: Can you describe a time when a course assignment gave you the opportunity to address a real-world problem? SP: I just completed MGT401: Leadership and Change which occurred simultaneously with a critical transformation in my company. The last module specifically focused on Organizational Change Management. John Kotter’s 8-Step Transformational Change Model provided great insight into what to do and what pitfalls to avoid during this intense time of organizational change. I was able to share strategies for communication to associates and senior leadership. Trident: What else would you like to share about your experience at Trident? SP: Professionally, I have been promoted twice to manage two different teams since enrolling in 2016. This challenge forced me to quickly refine my time management skills in order to balance all my competing priorities. At the same time personally, my father, who was and always has been my greatest role model, was diagnosed with pancreatic cancer in late 2015. He never stopped encouraging me to go back to school and finish my degree. He passed away in June 2017. Taking care of my grieving mother after losing her best friend of 42 years nearly caused me to give up on school. I didn’t know how I could manage it all. But I knew how much my father would want me to finish. After a brief leave of absence to grieve, I pulled up my sleeves and got back to it. I’ve completed 13 classes to date and will not stop until I have that degree in hand.